What’s the Project? 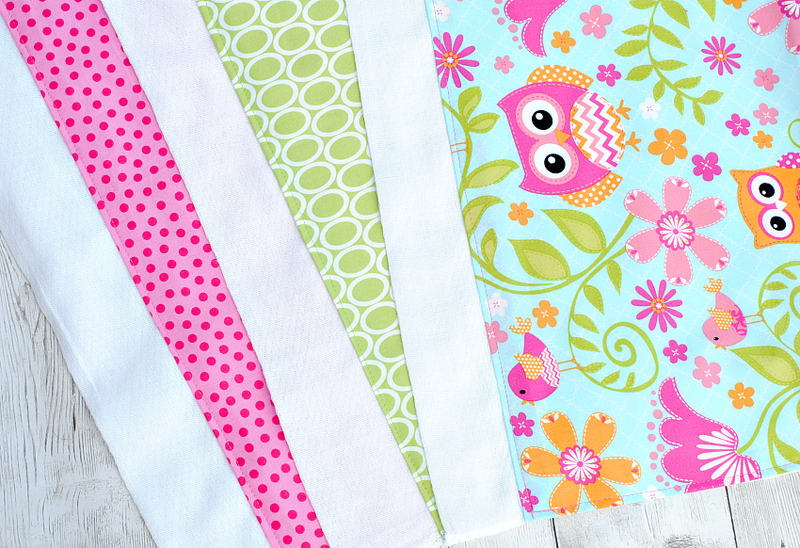 Make these easy baby burp cloths from cloth diapers for a wonderful baby gift! 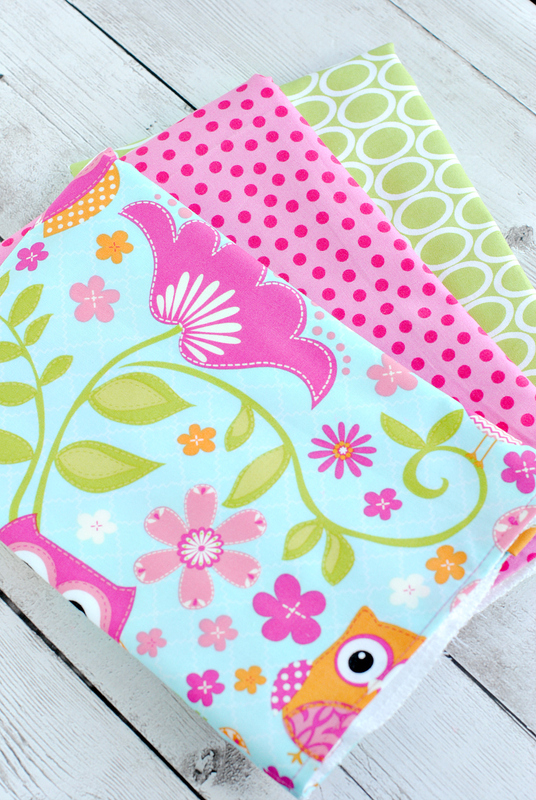 Easy to sew and something the new mom will love. This was one of the first posts ever to appear on Crazy Little Projects and it’s time to bring it back to life. This isn’t some ingenious idea or anything super fancy to make. It’s quick, it’s easy, and it’s cheap, but it makes a really great baby gift and they are very handy to have around. Plus, it’s a great beginner sewing project and I know how you guys like those! Easy Baby Burp Cloths made from cloth diapers. Perfect for any baby gift you need. The beauty of this is that they can be for boys or for girls, you can use fabric that fits the personality of whoever you are giving it too and you can package them up all cute. Important: Prewash the diaper first because they will shrink. Then iron them nice and flat again. Now you need a piece of cute fabric to fit the diaper. Make it about an inch longer than the diaper and about two inches wider than you want it to be when you are done. 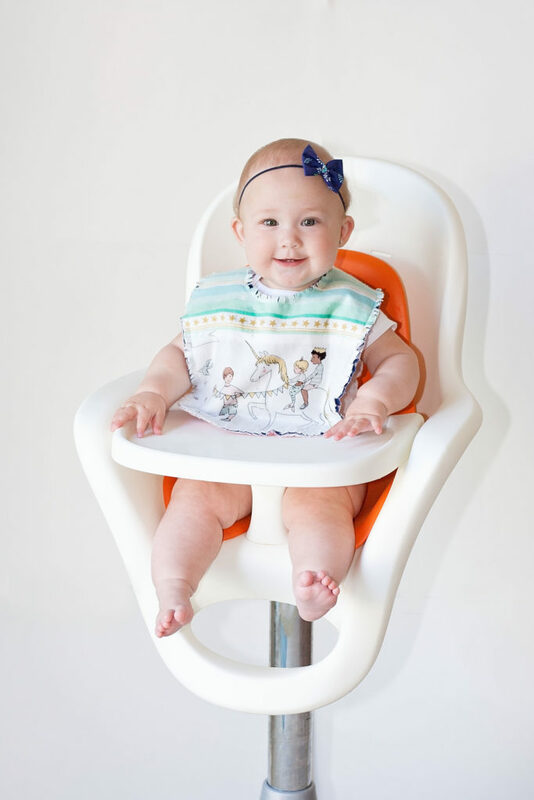 Measurements of your fabric should be about 21″ x 11.5″ but it varies a little depending on the diapers you buy, so measure your diapers to be sure. 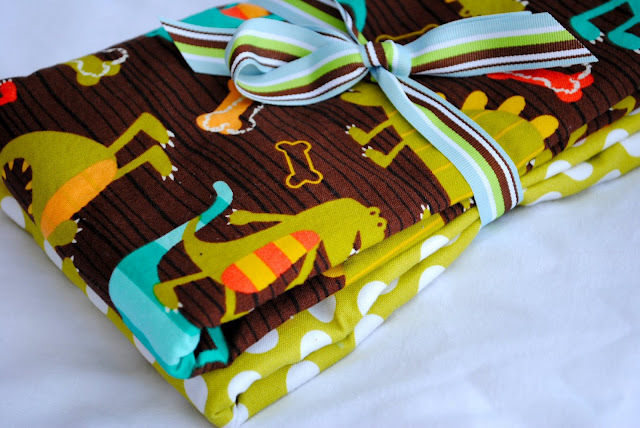 Fold under the side edges of your fabric about 1/2 inch and iron them to make a clean edge. Fold it under another half inch and press again. For the top and bottom, fold the fabric under about 1/2 inch on one end and press in place. Then place this at one of the short ends of your diaper and use this to measure how long it needs to be and where to fold in the fabric on the other end. Ideally it will match up exactly with the end of the diaper. Pin the fabric to the diaper so that it is centered from side to side and matches up with the end of the diaper the long way. 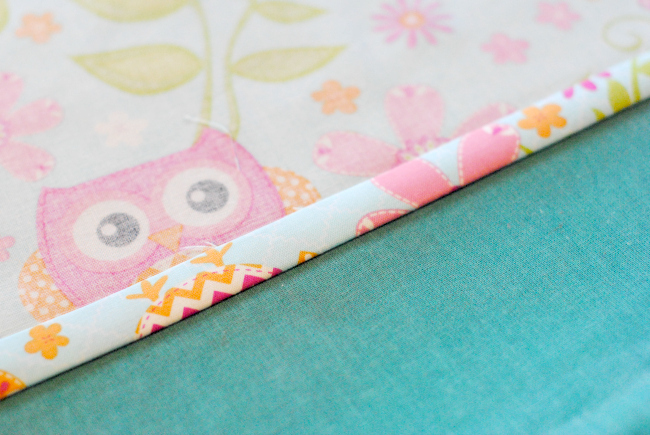 Then, start in one corner and sew a basic rectangle all the way around. I like to do 2-3 in a matching set. Tie it with a cute ribbon and bam! You have an adorable baby gift. Each one costs just a little over $1, so a set of 3 will cost less than $5. You know what would be really fun? 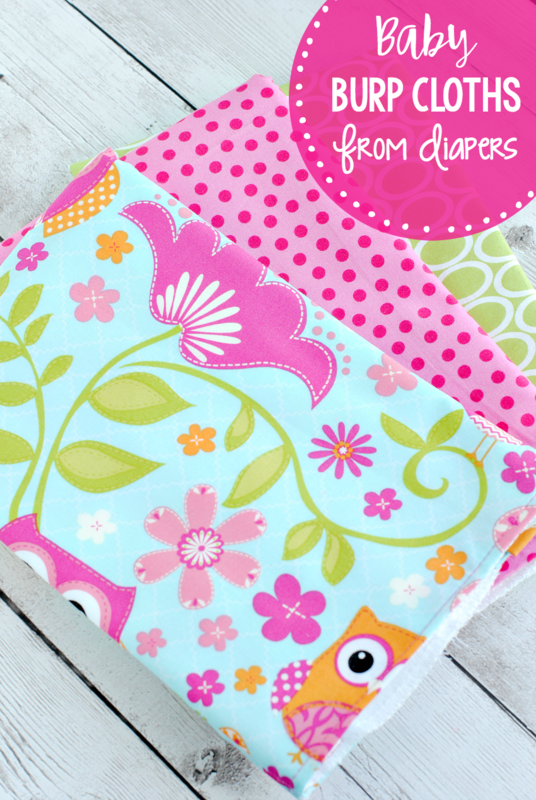 Pair it with this diaper and wipes carrier to make a PERFECT baby gift set! Super cute idea! 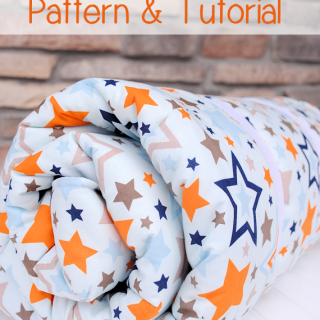 I agree – would make a really cute (and practical) baby gift! Thanks for sharing! P.S. – “Hopped” over from Chic on a Shoestring linky party – would love it if you could hop over and see me! Thanks! These are adorable and so useful!! Thanks for sharing – they’re cute! These are SO cute! And I love the price tag!! I need to start making these–what an easy and frugal gift! Thanks for sharing at oopsey daisy! These are just perfect!! I just had a friend contact me about making some and this is exactly what I will make!! Thanks for sharing. I followed you over from Wow Me Wednesday and I absolutely love these! The colorful patterns are the best. Perfect for a baby shower. I’m so dumb I don’t know the difference. Maybe you can tell me-they are the smaller, thicker ones. I’m so excited to start! Quick question: Did you used colored thread on the top and white thread in the bobbin so that the top thread matches your fabric and your bobbin thread matches your diapers? Or do the white and color show through the other side so it would just be better to use all colored? Good question! And the answer is really-either way you prefer. I usually use the same color bobbin as the thread I am sewing with but if you use white bobbin you won’t see the seam on the bottom so that could be nice too. 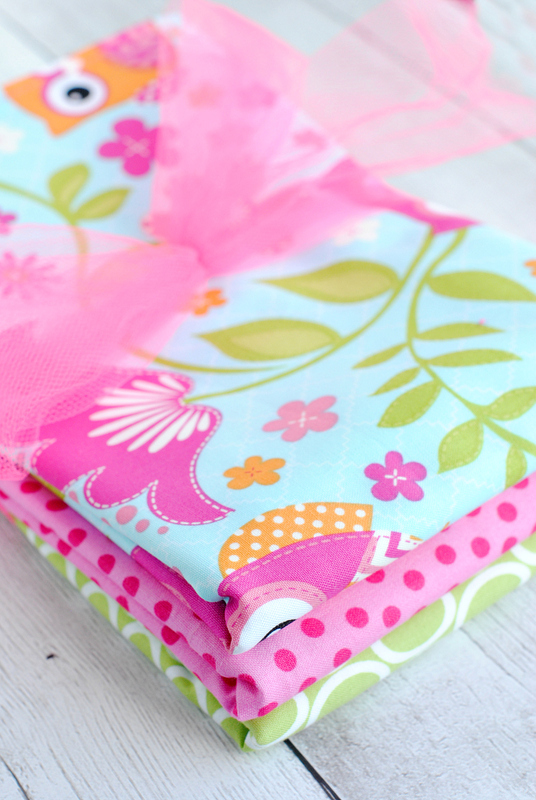 I have a question… first you sewed on a small piece of fabric down the center and then you covered it with the larger cute fabric? Or is one small one sewn on the front and the lager one on the back of the diaper. thanks for your help and the tutorial! Just 1 piece of fabric and 1 diaper. Cut the fabric so that it fits on your diaper once you hem the edges. Then just sew it in place. That’s it. I am confused. You mentioned leaving about 3 or 4 inches of white diaper showing so I am assuming the fabric is sewn onto the middle part of the diaper leaving the white showing when finished. ( Photo 1 ) When I see the last photo, it looks like the fabric is the same size of the diaper and sewn around the diaper without any white showing on the sides. I have never made a burp cloth before. Sorry to confuse you. The last picture I have it all folded up to look cute when I gave it as a gift. Yes, you should leave a little white showing around the edges. I am such a visual learner. I really need a picture of the completed burp cloth in its entirety if that’s possible. I have the same question as Susan. What happened to the extra white around the edges? See my answer to her, but basically I just folded those ones up to package them nice to give as a gift. So the white is just hiding. Sorry to confuse you! I feel really silly saying this…but i think that in the US cloth diapers are a bigger thing than in the UK. I would have no idea where to get some from here relatively cheaply. Could I use flannels/face cloths? Is that not what a cloth diaper essentially is ( but obviously bigger)? Yes, use anything soft and absorbent. Someone just suggested a hand towel which would work nicely too! Thank you Christy for posting a link! I was lost in all the different types! Now I know what I am looking for! Where can I get the dino fabric?! I love it!! It’s Michael Miller. I got it from http://www.hypernoodlefabrics.com I think. I read through the comments and I’m still confused. I think I understand but the white edges are really throwing me off. 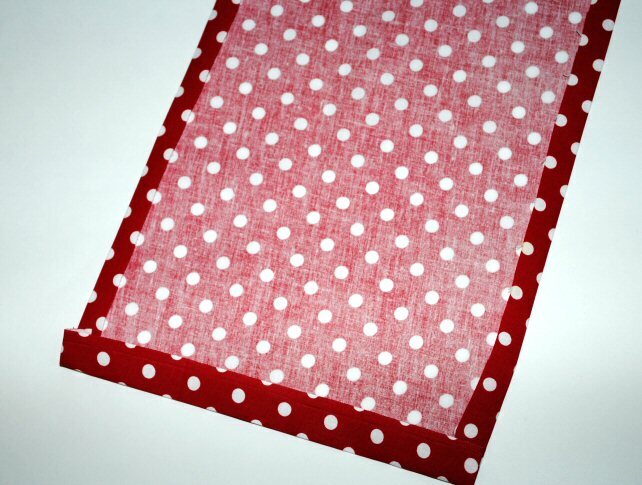 Do you have any photos of the finished burp cloth not folded so I can see what my edges should look like? P.S.- I’m rocking on those straight lines! Thanks for the first lesson and all the great tips! I am with Angie, i need to see a picture of both sides opened up all the way please. There is a picture on the post showing the white diaper. I will try to get a good picture of the whole thing tomorrow though and add it. I can’t get hold of these cloth diapers in the UK very easily ( or cheaply) – is there an alternative that you can recommend to me please? Anything soft and plush will work like fleece, a hand towel, etc. I bought a meter of toweling / Terry cloth at my local habadashery for 6 Euro as like in the UK twirling nappies are not readily available and the are expensive. now I just need to go make them up, wish we luck!! I’m really confused as to what is going on here. The white fabric on either side of the polka dots, is it being cut off in the end? Thank you for our first lesson. 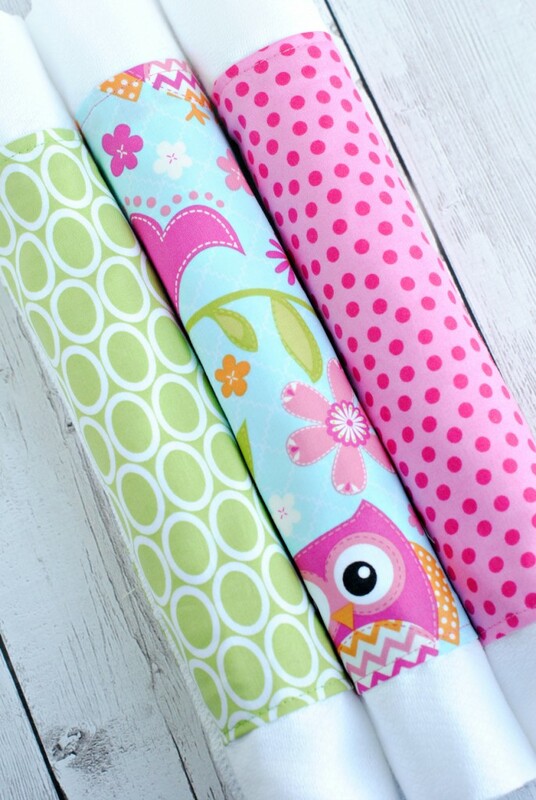 I love the ideal of the burp cloths really cute. Did you sew on the ric rac? I can’t see a stitch in it. Sorry it seems as though I am one of the only true beginners in this course! Yes, you just run one straight line right down the middle of the ric rac. And no, you are FAR from the only true beginner. I think I’m being difficult. I’ve read these instructions about 5 times and I still don’t understand. Ok I get that the fabric is a strip down the middle of the diaper and the the white ends of the diaper show. My first question is : Is the fabric only on one side? Is the back of the diaper totally white or do you lay out the diaper, put the fabric over top of it (as a strip down the middle), pin it and then fold the diaper in half sewing all the way around? Next question if you do fold the diaper in half – do you sew the fabric on first then fold the diaper in half and sew around the edge of the diaper? 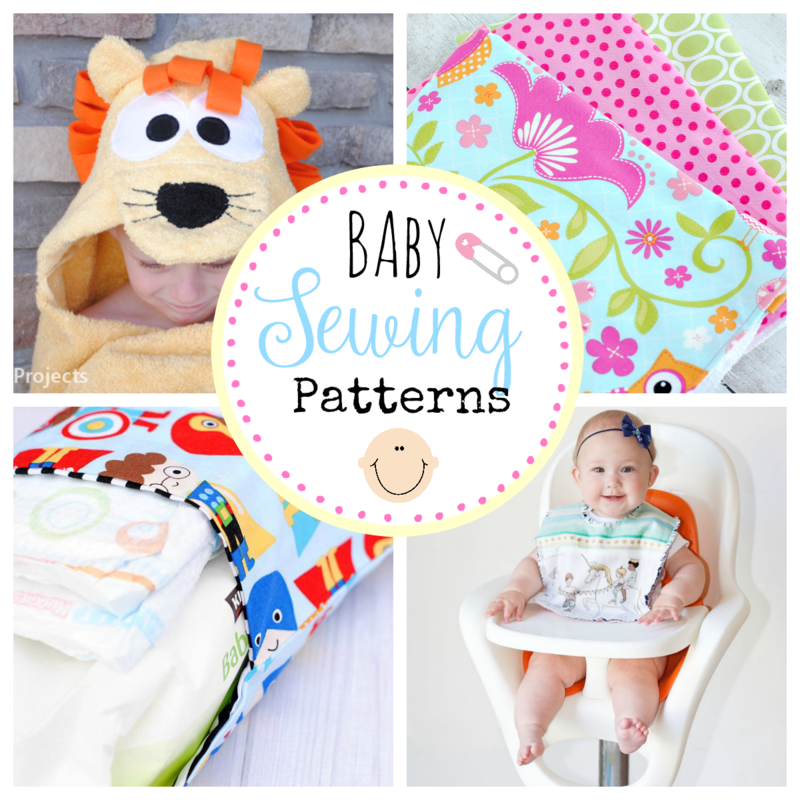 Or do you sew the fabric first then pin it to the diaper and sew again? If I understand correctly you do not fold the diaper in half. Lay it out flat, cut the fabric to the length of the diaper. She said the measurement is roughly 19″x 8″. Center the fabric on the diaper and sew around the fabric. The fabric will only be on one side of the diaper. What you said it is correct. I am sorry to confuse you. It’s really very simple. Grab your diaper, grab you fabric. Cut your fabric to be just a little bigger than your diaper length and just a little wider than you want it on the diaper. (Leaving a few inches of white showing on either side.) Fold the edges of your fabric under and iron them. 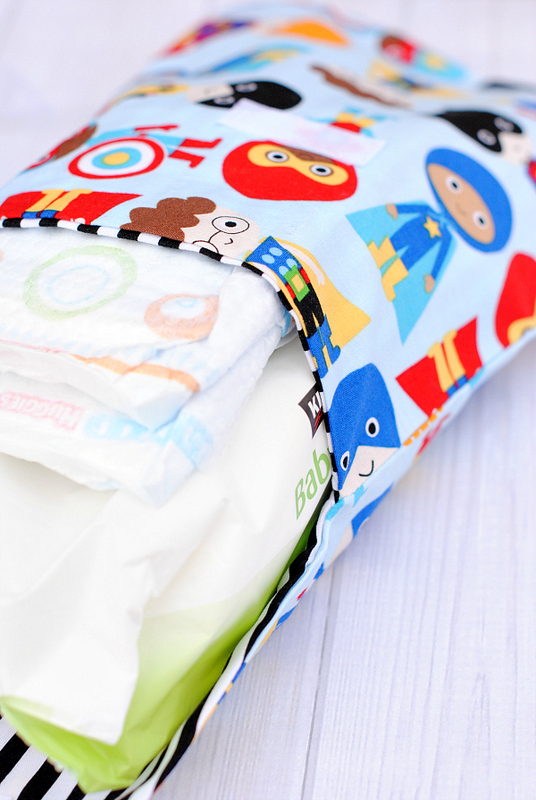 Pin it to the top of your diaper and sew around it in one big rectangle. That’s it. No folding, no fabric on the other side, etc. Thanks Megan and Amber. I get it now..lol Always making things harder than they have to be apparently. If you’re looking for cloth diapers don’t buy them at Target. They’re $17 where I live in Idaho for a 10 pack or 5 pack for $12.99!! You can buy a 10 pack at Walmart for $13.50. Just thought I’d share that. I went to the paint section at Walmart and purchased 6 terry towels for $3.88. I figure with the fabric on them they will work just great. I’m going to use mine as kitchen hand towels. thanks for the quick response I’m going right now to get some fabric. I wish I would not get so frustrated, but my diapers have fuzz balls all over them, they were stretchy and wavy all along the edges so they were hard to keep straight, and I used a zigzag stitch to sew on the fabric only to remember I was suppose to use a straight stitch (Sewing a Straight Line Lesson!). ha Grrr! Oh, and I somehow sewed up a straight pin on the inside between the diaper and the fabric! Well, I worked the pin out through the back side of the diaper, and guess I will pick off the fuzz balls tomorrow. My set is for a gift. On a positive note, I know which diapers NOT to buy next time. :) Yours in your picture look like a better quality of diapers than what I got. I’ll go to Target next time. One question though, how do you knot when you use a zigzag stitch? I just put my stitch length on 0 and stitched about 6-8 times in one spot, then started sewing. Not sure if that’s right. ?? Don’t get too frustrated. Sewing takes time and practice. You will get better and better and better. And the baby’s not going to care if your lines aren’t perfect. :) As for the zigzag, this will be in Lesson 2, but you do it the same as with the straight-just go forward an inch, back an inch and then forward again. I just finished my VERY FIRST sewing project!! The burp cloth came out so much better than I expected :) Excited for next weeks project! Thank you so much this was a very easy project and will make a great gift. Didn’t notice till after I bought the diapers that you used the prefolded for the thickness in the center, so I just folded the ends and sides in about three inches all the way around and then sewed on the center fabric. So my first one was cute but not thick enough in the center. Will let you know my solution on the next one. Have a couple of ideas so I don’t have to buy more diapers. Again thank you can’t wait to make the next project with you. Maybe fold it in thirds so that it is 3 layers thick? Just completed my burn cloths…just used a cute fabric and a soft fabric for mine since I wasn’t able to get out to purchase the cloth diapers but it was fun! Can’t wait for this weeks lesson and project! I love it I will give it a try. Good gifts for parents to be. I cannot, for the life of me, draw a straight line — you would think I could sew a straight line……but, no, I just keep drifting sideways. Gonna keep working on this, these are so cute & should be so easy. Thanks so much for helping us newbies get started! @Peggy, when I first learned to sew, a friend told me to take a long piece of painters tape and tape it as the seam line I was sewing. It helped me a lot to learn to sew straight lines. The painters tape doesn’t leave a sticky residue, and can be reused by just moving it to the seam you are focused on. I hope this helps! That is BRILLIANT! Thank you!! You said to wash the burp cloth. Do you put it in the dryer and also do you wash the fabric you will sew on it as well? Yes, definitely dry because that’s where it will shrink and yes, it’s always best to prewash the fabric too. Do you sew on the ribbon and embellishments too? If not how do you apply those? Yes, I sew them in place. If you use ribbon as embellishment, do you prewash the ribbon? I never have. I actually never thought of it but I think you are fine not doing it. Thank you for sharing. They are adorable i have a grandbaby on the way, and my pseudo adopted daughter is expecting, so i will get lots of practoce. Lol. Please post the diaper and wipe carrier. You are such a doll, i can just tell that you have a good heart. Could you start summer stuff? Do you pre shrink the fabric too? Or just the cloth diapers before hand? Just two questions. For the bird cloths, what material did you use? Flannel or something else? 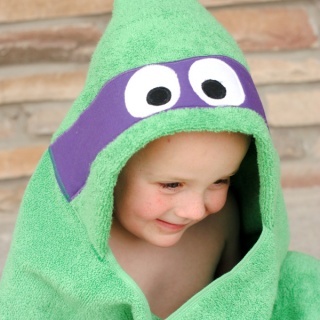 Also if making a Twitter nfant hooded towel, so you still use a bath towel, just seems like that would be way to big… thank you for all your wonderful ideas you share with us!! !… you are the best!! !